As autumn leaves begin to fall and crisp, cool nights herald the change of the seasons, let this elegant gift help to celebrate all things fall. Designed in rich, fall hues and a beautiful leaf pattern, this gorgeous tower will send a message full of warmth and sweet tidings. 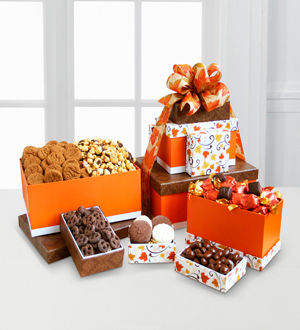 Each beautiful box holds something special, including Godiva dark chocolate caramels, sweet chocolate chip and ginger cookies, milk chocolate-covered cashews, milk chocolate dipped pretzels and milk and dark chocolate-covered sandwich cookies. A perfect gift for friends, colleagues and family celebrations.